in the face of Christ. On Epiphany Day we prayed, “O God, by the leading of a star you manifested your only Son to the peoples of the earth: Lead us, who know you now by faith, to your presence, where we may see your glory face to face.” Today, we witness this glory face to face with Peter, James, and John, in the luminous Cloud of Presence. Moses and Elijah discuss with Jesus his exodus : “his departure which is to be accomplished in Jerusalem.” And now, “face set toward Jerusalem,” it is time to turn toward that dark path of self-sacrificial love. In John's Gospel Jesus admonishes his friends to “walk while you have the light... believe in the light, that you may become children of light” (12:35-36). For these last days of Epiphany Christians contemplate with the eye of the soul that Light that never changes (meditation one) and the soul as dwelling place of ineffable glory (meditation two). But then, with memories of light, it is time to turn toward Jerusalem, the confusion of our particular lives, and the cost of bearing Light in a dark world. (meditation three). Have a good end-of-Epiphany meditation in these most holy days of blessed light ! I entered into the secret closet of my soul, led by Thee; and this I could do because Thou wast my helper. I entered, and behold with the mysterious eye of my soul the Light that never changes, above the eye of my soul, above my intelligence. It was not the common light which all flesh can see, nor was it greater yet of the same kind, as if the light of day were to grow brighter and brighter and flood all space. It was not like this, but different: altogether different from all such things. Nor was it above my intelligence in the same way as oil is above water, or heaven above earth; but it was higher because it made me, and I was lower because made by it. He who knoweth the truth knoweth that Light: and who knoweth it, knoweth eternity. Love knoweth it. Jesus and the disciples go up the Galilee side of the mountain and come down the Jerusalem side. guiding with light the whole creation. When the soul is counted worthy to enjoy communion with the Spirit of the light of God, and when God shines upon the soul with the beauty of his ineffable glory, preparing her as a throne and dwelling for himself, she becomes all light, all face, all eye. Then there is no part of her that is not full of the spiritual eyes of light. There is no part of her that is in darkness, but she is transfigured wholly and in every part with light and spirit. Just as the sun is the same throughout, having neither back nor anything irregular, but is wholly glorified with light and is all light, being transformed in every part; or as fire, with its burning sheath of flame, is constant throughout, having neither a beginning for an end, being neither larger nor smaller in any part, so also when the soul is perfectly illumined with the ineffable beauty and glory of the light of Christ’s countenance, and granted perfect communion with the Holy Spirit and counted worthy to become the dwelling-place and throne of God, then the soul becomes all eye, all light, all face, all glory, all spirit. When I consider the short duration of my life, swallowed up in the eternity before and after, the little space which I fill, and even can see, engulfed in the infinite immensity of spaces of which I am ignorant, and which know me not, I am frightened, and am astonished at being here rather than there; for there is no reason why here rather than there, why now rather than then? Who has put me here? By whose order and direction have this place and time been allotted to me? Yet where we imagine losing, it is all gain. How can one experience this? By giving oneself totally in love. If I let God take hold of me more and more; possess me, as fire possesses the burning log, then I give off light and heat to the whole world even though the influence be completely hidden. And just as at the baptism, the voice of the Father confirms here, too, that this poor, praying Jesus, consecrated for suffering, and heroically prepared for the cross, is God's very beloved Son. 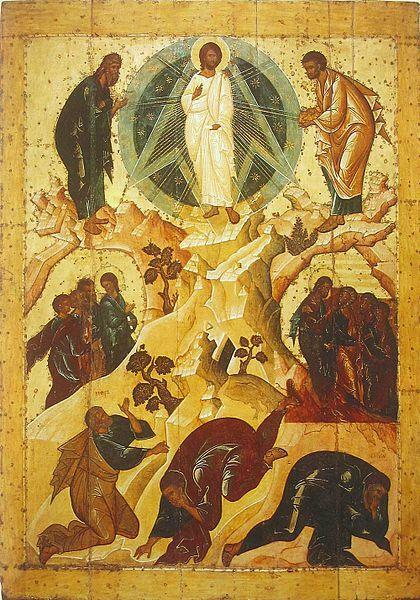 This then is the meaning of the transfiguration for Jesus himself: in the dark night of earthly hopelessness the light of God shines, a human heart finds in God the power in which turns a dying into a victory and into the redemption of the world.